Mr. Clint Eastwood, gotta hand it to ya! Hereafter has stopped my heart a few times watching those Tsunami scenes in the beginning of the movie (especially after #JapanTsunami). Of course I watched this movie because of Matt Damon; I am a huge fan. I didn't quite like the ending but I guess we have to understand Mr. Eastwood in order to reach some kind of settling conclusion. I thought after Gran Torino he has a big shoe fill in. 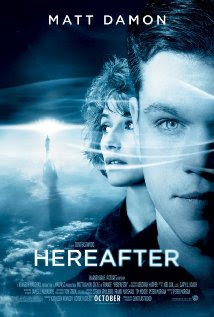 This movie is about 3 people crossed path in dealing with after-life. The 'build-up' I reckon to some people maybe a little slow (judging from my sister fell asleep half way through-she's probably tired), but you have to bear in mind, there are people who still looking for answers about 'afterlife'. This movie tackles the issue zooming into these 3 characters lives from San Fran, Paris and London. If you are a softy like me, get ready with some tissue papers next to you. It's deeply moving. Great acting from Matt Damon (of course) and the rest of the casts. Some familiar British actors and great smooth performance by Cecile De France.